How much is Rich Costey Worth? Calle 13 Net Worth: Calle 13 is a Puerto Rican band of two stepbrothers and their half-sister who has a net worth of $10 million. Calle 13 was formed by stepbrothers René Pérez Joglar (born February 23, 1978 in Hato Rey) and calls himself Residente and performs as lead singer and songwriter and Eduardo José Cabra Martínez (born September 10, 1978 in Santurce) and calls himself Visitante and performs as a multi-instrumentalist, vocalist and beat producer and their half-sister Ileana Cabra Joglar (aka PG-13) who sings background vocals. The group first landed a record deal (with White Lion Records) after submitting a demo tape. During the making of their first album, Filiberto Ojeda Ríos, leader of the Puerto Rican revolutionary group known as Los Macheteros, was killed in the course of arrest by the F.B.I., which outraged brother 'Residente' and he wrote a song protesting what happened to Ojeda, asking their record label to allow the group to release it on the Internet through viral marketing through Indymedia Puerto Rico, an alternative news website. 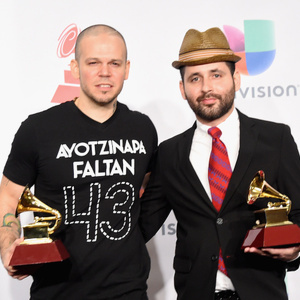 Calle 13 is noted for its eclectic musical style, often using unconventional instrumentation in its music, and although most people have labeled Calle 13's music as reggaeton, they try to distance themselves from the style. The band is also known for its satirical lyrics, as well as social commentary about Latin American issues and culture. Residente's distinctive lyrics tackle an eclectic list of subjects, even mentioning (and sometimes deriding) celebrities and popular icons such as Mickey Mouse, Redman and 2Pac. The stepbrothers are strong supporters of the Puerto Rican independence movement, a stance that has generated controversy. For their work, the group has won nineteen Latin Grammy Awards. They hold the record for the most Latin Grammy wins and have also won two Grammy Awards.